Tellem Plank Figure, Dogon, Mali. 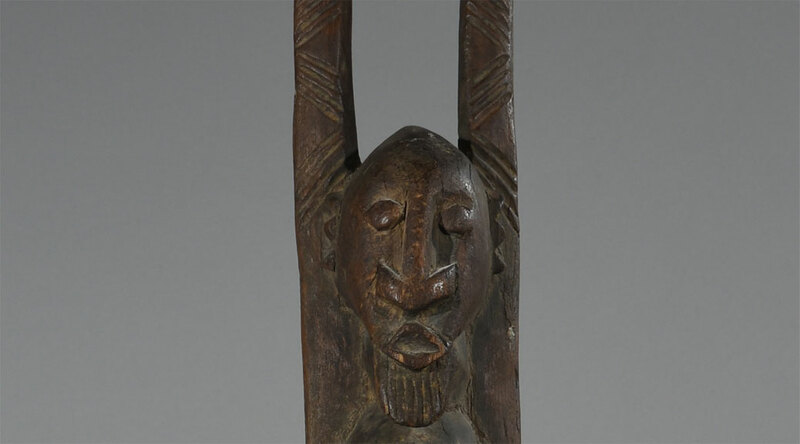 A figure with raised arms is one of the most common types of Dogon sculpture and is said to refer to prayers for rain, crucial in this dry region. 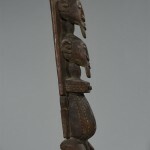 This gesture can be found on relatively naturalistic Dogon figures as well as on those that have been transformed into arrangements of geometric shapes, like this example. 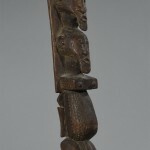 Here the artist has created a double image – a figure with raised arms carved in relief on a highly abstract, plank-like figure that also has raised arms. The figure in relief wears a tapering coiffure and has an odd-looking pointed chest. 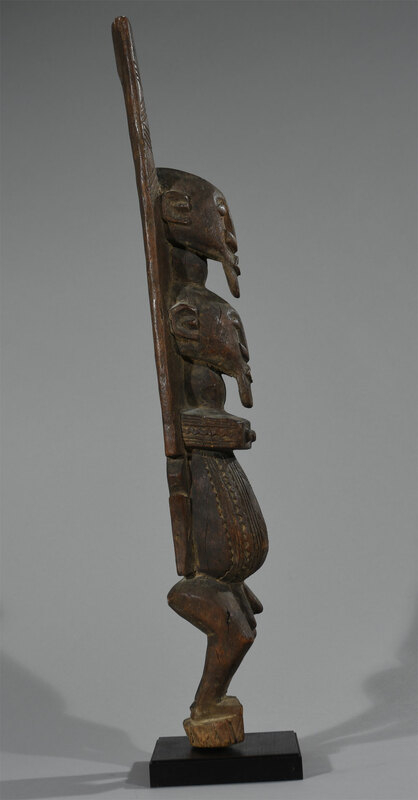 The plank figure tapers to a point at the bottom, presumably because it leaned against a wall or was placed flat on the ground, as in altars dedicated to deceased family members and binu, ‘immortal’ ancestors revered by an entire clan. 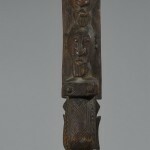 Flat plank figures like this are not uncommon in Dogon art. The flat part may extend full length of the figure, or may end above the hips. 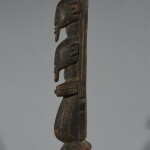 These figures are almost always coated with a thick crust of sacrificial materials and often have notches cut in each side. In some cases these notches suggest the indentation of the torso between the shoulders and the hips. Figures in the form of planks have been found in the Tellem caves, which indicates that the motif may be quite old. 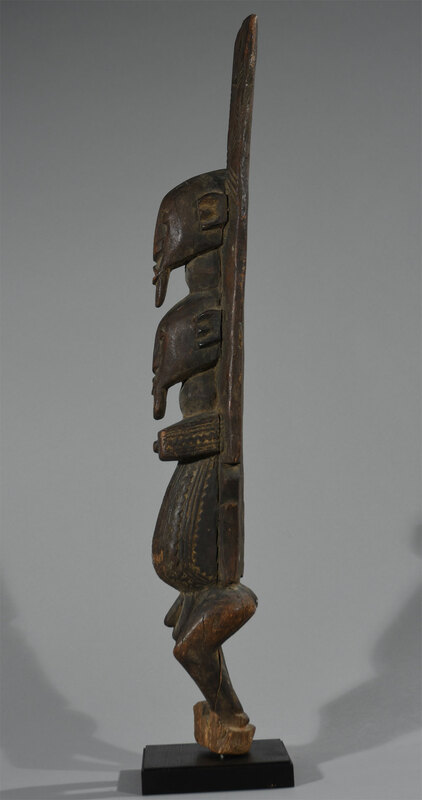 However, some of the most full-volumed, naturalistic Dogon sculptures, stylistically opposed to the plank figures, also seem to be among the oldest, suggesting once again that style is not a useful factor in determining the age of a Dogon sculpture. The Tellem are thought to have occupied the region of the Bandiagara escarpment until the sixteenth century. The Dogon, who fled to the remote cliffs of eastern Mali in the 14th and 15th century to escape conversion by invading Fulani Muslim, have become guardians of the Tellem culture. The woodcarvings only came to light after the Second World War. These figures are kept in the granaries and the Dogon place sacrificial vessels before them (Leuzinger 1960, p 82). Other figures exist which combine both Tellem and Dogon characteristics, which, along with the melding style of architecture on the lower cliffs, supports the Dogon assertion that they once lived together with the Tellem (Wassing p. 185). Condition: Fantastic well carved. In an unusually well-preserved quality without chipping and scratching. Age: Late 20th to early 21st Century. Sunde had an “Etnografica” boutique in 1948,that became recognized among collectors as the most specialized boutique of its kind at the time. 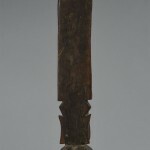 Tribal and oriental artifacts were purchased from private collectors as well as at auctions in Paris, Amsterdam and London, among other places.